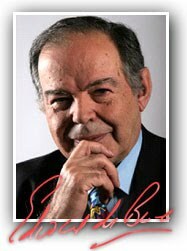 I first met Dr. Edward de Bono at an International Conference on Thinking. This conference, held every 3 years, brings together researchers and experts on cognition, intelligence and thinking to discuss the latest findings and insights into various aspects of thinking. Dr. de Bono is an acknowledged leader in the field of lateral thinking and creativity. With over 68 books to his name, he has a lot to offer by way of practical advice and wisdom on how to use your mind to achieve more success and happiness in life. In Dr. de Bono's book, 'The Happiness Purpose' he claims that happiness can best be achieved through a combination of thinking, humor and dignity. Key to this process is the practice of respect. Ed believes that happiness is a legitimate purpose of life and that it requires disciplined pursuit. Such discipline includes using lateral thinking and other thinking tools to focus on happiness, self-respect and purpose in your life. To achieve lasting happiness, Dr. de Bono maintains you need to actively practice respecting yourself, respecting others and respecting society. Added to this he suggests that daily acts of help and contribution to others will provide meaning and joy. So practice the 4 H's daily and you'll be happy that you have.